Have questions about our EIFS System in Columbus Ohio? Often referred to as 'synthetic stucco', EIFS or Exterior Insulation Finish System is a siding product that provides commercial and residential exterior walls with an insulated, finished and water resistant surface. 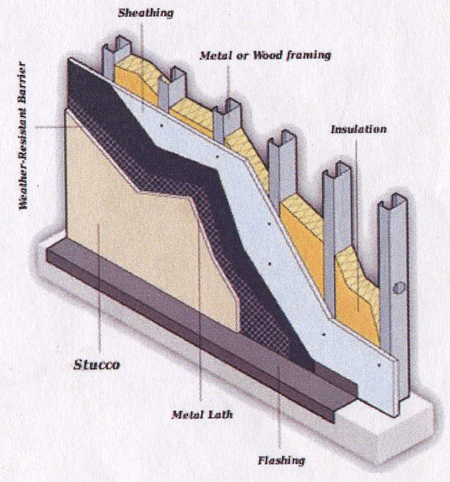 Although called synthetic stucco, EIFS is far from Portland Cement stucco. EIFS is a lightweight product that incorporates from plastic insulation and synthetic coatings. There are a number of different versions of EIFS but the most common or traditional EIFS is "Barrier EIFS". Our EIFS system in Columbus Ohio is often used in commercial capacity (offices, shopping centers, hotels, and so on) but is increasingly being recommended by architects for residential properties. Although EIFS is primarily used for new construction, it can also be used on existing walls which is known as "retrofitting". Despite the obvious benefits of an upgraded look, retrofitting EIFS is also most attractive from a convenience standpoint as normal business is largely unaffected throughout. Installation of standard barrier EIFS is carried out by utilizing an cementitious or acrylic based bonding agent and 3 "layers". A layer of Expanded Polystyrene or (EPS) followed by a reinforcement layer of fiberglass mesh embedded in and acrylic modified base coat, and finished with a troweled or sprayed on top-coat. if a "drainage" system is required, however, a water-resistant barrier is first installed over the substrate which is succeeded by a woven fiberglass lath. EIFS has witnessed a fair share of controversy over the years due to water leakage in EIFS installed home. While EIFS is no more susceptible to water penetration that any other exterior wall cladding, critics would argue that non-water managed EIFS systems, such as barrier EIFS do not allow water that may have entered the building envelope to escape. The most notable downside that we have found with EIFS is simply its "soft finish which is highly prone to damage and possible vandalism. Overall however, it is a proven system that when installed 100% correctly, will give no more problem than that of any other exterior wall finish. For more information on our EIFS system in Columbus Ohio contact us today!